Conductive plastic compounds are compounds of organic polymers that conduct electricity. They are also referred as intrinsically conducting polymer compounds. Conductive plastic compounds offer reliability and cost-effectiveness for applications that need electrostatic discharge control, explosive atmosphere, and electromagnetic interference shielding. These compounds are primarily used in metal replacement solutions, detection sensors, heating elements, air cleaning systems, and dust suppression. They are also used to prevent electrostatic attraction. Conductive plastic compounds are recyclable. They possess properties such as fast processability and are vcost-efficient. Conductive plastic compounds can be extruded or injection molded into desired shapes and sizes. The global conductive plastic compounds market is expected to expand at a significant pace during the forecast period, driven by the increase in production of electrical components and electronic devices. The conductive plastic compounds market was valued at around US$ 7,500.0 Mn in 2017 and is projected to expand at a CAGR of around 10.0% during the forecast period. Conductive plastic compounds are primarily used in the electrical & electronics industry. These compounds are deployed in a wide range of antistatic and electromagnetic shielding applications. Thermally and electrically conductive plastic compounds were developed through the addition of common fillers such as carbon black, graphite, metallic fibers, flakes, or carbon fibers. Conductive plastic compounds possessing high content of conductive fillers exhibit high degree of electrical conductivity. These conductive plastic compounds offer adjustable electrical conductivity. They are light in weight and possess good processability. They are also mass-production friendly and cost-effective. Recently, electric and electronic products have gained increasing importance in a number of end-use industries. Growth in popularity of miniaturization, specifically in the fields of electronics, electrical engineering, communications engineering, and automotive engineering, is boosting the need for high quality electric and electronic components. Increase in production of such high quality electric and electronic components is projected to augment the demand for conductive plastic compounds. Demand for conductive plastic compounds containing nanofillers, such as carbon nanotubes, is high owing to their exceptional physical properties. Carbon nanotube-based conductive plastic compounds offer reliability for applications that require protection from electrostatic discharge, dissipation of static charges, and effective thermal management. Carbon nanotube based conductive plastic compounds are primarily used in heat exchangers and fuel cells owing to their electrical and thermal conducting properties. High usage of conductive plastic compounds in the electrical & electronics industry is likely to propel the conductive plastic compounds market during the forecast period. Advancements in filler material technology is estimated to influence the physical and chemical properties of conductive plastic compounds. Research programs and government initiatives on conductive plastic compounds are expected to encourage product development and manufacturing process development. Rise in awareness regarding filler material technology and filler material application among electric and electronic component manufacturers is anticipated to boost the demand for conductive plastic compounds. Plastic compounders and plastic converters are undergoing product development through stable, resource-saving, and energy-efficient processes. Increase in product development programs among conductive plastic compound manufacturers and rise in research and patents activities regarding filler materials among institutes and universities are estimated to propel the conductive plastic compounds market during the forecast period. Asia Pacific is a significant region of the global conductive plastic compounds market, accounting for substantial market share. China is a major consumer of conductive plastic compounds due to the high rate of adoption of conductive plastic compounds in electrical & electronics applications. Furthermore, the country is a leading producer of conductive plastic compounds. Presence of large electrical and electronic component manufacturers and existence of various small domestic plastic compound manufacturers in the region are expected to drive the conductive plastic compounds market in Asia Pacific. Relocation of manufacturing capacities of electrical components and electronic devices from the western hemisphere to East Asia is anticipated to boost the demand for conductive plastic compounds. Furthermore, plastic compounders in Asia Pacific are expanding their production facilities to match the surging demand for conductive plastic compounds in several end-use industries in the region. 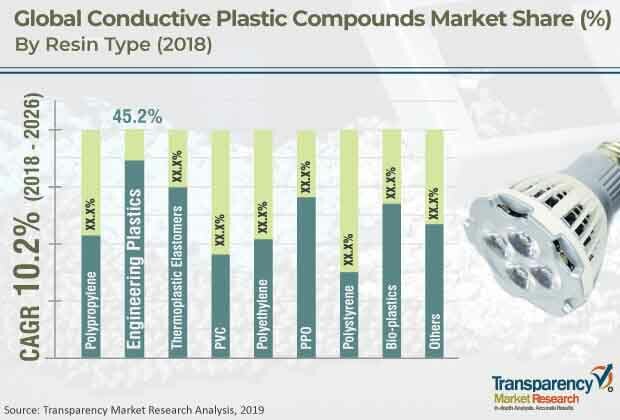 Rapid industrialization and expansion of electrical & electronic component manufacturing plants in India, South Korea, Thailand, and Vietnam are projected to propel the demand for conductive plastic compounds. The impact of ongoing research & development activities among universities and plastic converters & compounders in North America and Europe is high. Therefore, the conductive plastic compounds market in North America and Europe is likely to expand at a rapid pace during the forecast period. Major players operating in the global conductive plastic compounds market include BASF SE, RTP Company, LyondellBasell Industries Holdings B.V., Mexichem Specialty Compounds Inc., SABIC, DowDuPont Inc., Coperion K Tron, Adell Plastics, Inc, Sojitz Corporation, Ravago, Polyvisions Inc, and A.Schulman. These are large plastic converters and compounders possessing dedicated manufacturing technologies, and experience and expertise to manufacture conductive plastic compounds. The global conductive plastic compounds market is highly fragmented; the top five manufacturers accounted for nearly 30% share of the market in 2017. Most of the conductive plastic compounds are produced in Asia Pacific. Compounder and converters functioning in the market are focusing on research programs and product development activities to cater to the rising demand for conductive plastic compounds in the electrical & electronics industry. This strategy enables prominent players to meet the increase in requirements of electrical & electronic industries and gain dominant share of the conductive plastic compounds market. The report analyzes and forecasts the conductive plastic compounds market at a global and regional level. The market has been forecast based on volume (tons) and value (US$ Mn) from 2017 to 2026. The study includes drivers and restraints of the global conductive plastic compounds market. It also covers the impact of these drivers and restraints on the demand for conductive plastic compounds during the forecast period. The report highlights opportunities in the conductive plastic compounds market at the global and regional level. The report comprises a detailed value chain analysis, which provides a comprehensive view of the global conductive plastic compounds market. The Porter’s Five Forces model for the conductive plastic compounds market has also been included to help understand the competitive landscape. The study covers market attractiveness analysis, wherein end-users are benchmarked based on their Market Value, growth rate, and general attractiveness. The study provides a conclusive view of the global conductive plastic compounds market by segmenting it in terms of resin type, filler type, end-user industry, and region. These segments have been analyzed based on the present and future trends. Regional segmentation includes the current and forecast demand for conductive plastic compounds in North America, Latin America, Europe, Asia Pacific, and Middle East & Africa. The report also covers the demand for individual end-user industry segments in all the regions. The study includes profiles of major companies operating in the global conductive plastic compounds market. Prominent players profiled in the global conductive plastic compounds market include BASF SE, RTP Company, LyondellBasell Industries Holdings B.V., Mexichem Specialty Compounds Inc., SABIC, DowDuPont Inc., Coperion K Tron, Adell Plastics, Inc, Sojitz Corporation, Ravago, Polyvisions Inc, and A. Schulman. Market players have been profiled in terms of attributes such as company overview, business strategies, recent developments, and financial details. The report provides size (in terms of volume and value) of the conductive plastic compounds market for the base year 2017 and the forecast for the period between 2018 and 2026. Market numbers have been estimated based on resin type, filler type, end-user industry, and region. Market size and forecast for each resin type, filler type, and end-user industry have been provided in terms of global and regional markets. In order to compile the research report, in-depth interviews and discussions have been conducted with several key market participants and opinion leaders. Primary research represents a bulk of research efforts, supplemented by an extensive secondary research. Key players’ annual reports, press releases, and relevant documents have been reviewed for competition analysis and market understanding. Secondary research also includes a search of recent trends, technical writing, Internet sources, and statistical data from government websites, trade associations, and agencies. This has proved to be a highly reliable, effective, and successful approach for obtaining precise market data, capturing market participants’ insights, and recognizing business opportunities.